Who would have thought that Jacques Audiard, the French director of slow-burn, humanistic character studies would one day take on one of the most characteristically American of genres, the Western, with his English-language debut? While worlds apart from his socially realist “Dheepan” and “Rust and Bone,” Audiard’s “The Sisters Brothers” sports a similarly closely watched, leaned in sensitivity with its brotherly story. Adapted from Patrick deWitt’s 2011 novel (by Audiard and Thomas Bidegain) and infused with sweetness, graphic body horror (that, at times, spins a childlike icky humor) and a high body count, this alcohol-soaked Frontier road trip constantly reinvents itself at every turn in fun, witty and ultimately touching ways. Call it a revisionist or an absurdist Western if you will, but Audiard’s film feels both refreshingly new (without ever going to the extreme lengths the Zellner Brothers did with “Damsel”) and nostalgically familiar. The backdrop is the Gold Rush, which is said to have made a Sherriff’s job much easier: if there’s trouble, you follow the gold to get to the source of the unrest. But when we meet the central brothers Eli (John C. Reilly, goofy, soulful and great at physical comedy as ever) and Charlie (Joaquin Phoenix, quietly enigmatic) one random dark night at the start of the film, there doesn’t seem to be any wealth to be pursued. With the playful last name “Sisters,” the pair of cold-blooded hit-men, without much thought about the consequences of their actions, murder a household of people in a tightly orchestrated set piece of nocturnal shootouts. The reason remains unknown—with this job and everything else, the ruthless duo answers to a much feared, mostly unseen mysterious crime boss called ‘The Commodore’ and habitually assassinates their way through the 1850s Oregon. Along the way, they bond and trivially bicker about life as casually as they kill. But just when the soft-edged Eli starts contemplating his future and ongoing profession despite the unaffected heavy drinker Charlie’s shrugs, The Commodore sets them up for a new task. They will tail and kill a criminal called Hermann Kemit Warm (Riz Ahmed, cheekily mysterious) for reasons we would slowly piece together later—for now, he is just a thieving enemy who once betrayed their boss. Enter Morris (Jake Gyllenhaal, reuniting with Ahmed after “Nightcrawler”), a British-accented bounty hunter for hire, tasked with delivering Warm to the brothers. But then the prospect of immediate wealth turns tables for everyone involved—the brainy chemist Warm’s creamy invention that makes gold glaringly appear in water, redefines priorities at once. The two pairs, traced on parallel storylines for a while (that admittedly slows down the film’s previously absorbing rhythm), find themselves entangled in a ploy against each other. Along the way, local madams, kindly prostitutes, further the accidentally amusing events and some dead horses unfortunately enter the story, sharpening the film’s tone as an original yet studied homage to its genre. 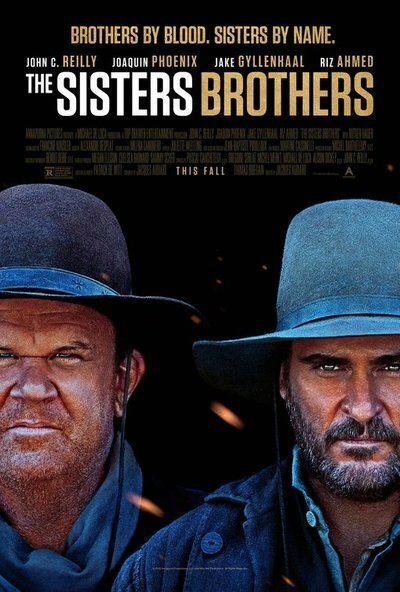 A delightful tale of familial ties balanced well with a slick cat-and-mouse yarn, “The Sisters Brothers” owes much of its breezy charm to John C. Reilly, whose comic timing does wonders for the meatiest and most multifaceted character of the ensemble. Phoenix feels right at home in Charlie's quieter shoes, while Gyllenhaal’s familiarly on-edge persona and a mischievous turn from Ahmed impress. Reilly and Phoenix demonstrate tremendous chemistry throughout—we buy both their longtime amity and occasional callousness, especially when the script drip-feeds the brothers’ back-story into the narrative. In this bittersweet tale with a sentimental heart, and among a dangerous milieu of blood, greed and spiders (one in particular that causes the film’s biggest gross-out moment), Audiard’s characteristically sensitive touch gradually lifts familial emotions, letting them linger in the air long after the credits roll. This review was originally filed from the Toronto International Film Festival on September 9th.